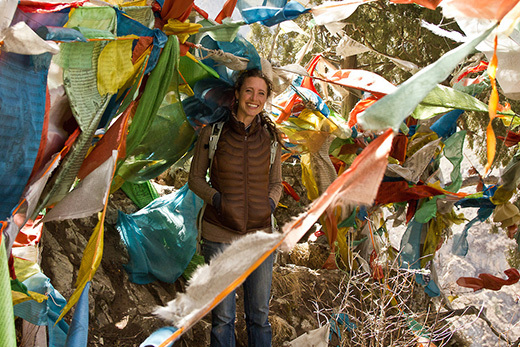 Tawni Tidwell amid Tibetan prayer flags in eastern Tibet. Photo by Shane Witnov. Tawni Tidwell is the first Westerner to be certified in Tibetan medicine by Tibetan teachers in the Tibetan language. The PhD candidate in Emory’s Department of Anthropology is now working on a dissertation about how Tibetan physicians diagnose diseases, especially cancer. Tidwell was born in Colorado but lived from the ages of two to five in South Korea, where her father was a U.S. Army surgeon. Tidwell and her mother lived in mainstream Seoul, which gave her an affinity for Asia when she returned to Colorado. She was also influenced by the Native American ancestry on both sides of her family and by the ecology of Colorado, where she became involved in rock climbing and winter mountaineering. Tidwell has trained as an animal tracker, worked as a ranger at a biological preserve, taught wilderness survival lessons, and led gap-year students on trips to learn about traditional cultures through the “Where There Be Dragons” program. Tidwell studied at the premier Tibetan medical school outside of Tibet, in northern India (the cultural and intellectual capital of the displaced Tibetan community). In order to enroll, she had to pass a five-day exam of memorized Tibetan grammar and Buddhist logic, as well as general Tibetan cultural knowledge. From there on, each year she had to recite from memory 115 pages of a medical textbook in Tibetan, considered one of the most difficult languages for non-native speakers to master. She also had to complete written exams, coursework and attend classes, all in the Tibetan language among Tibetan peers. Read an interview with Tidwell, covering some of the milestones of her long and winding road to becoming a certified Tibetan medical practitioner.